Libraries, filing cabinets, and archives around the county are gold mines full of information that can be used to monitor vegetation change, shrub encroachment, or urban/suburban development over time. Historic aerial photos offer land managers a chance to "see" the past in order to better prepare for the future and manage the present. 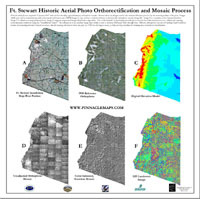 PMT can scan, orthorectify, and mosaic historic aerial photos so that they can be used for spatial analysis in a GIS environment. 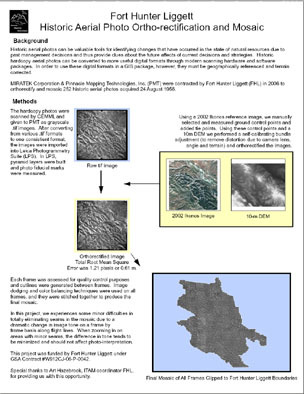 To view a document describing the process of taking historic orthophotos and creating a color-balanced seamless mosaic, click on the thumbnail below or to the right.